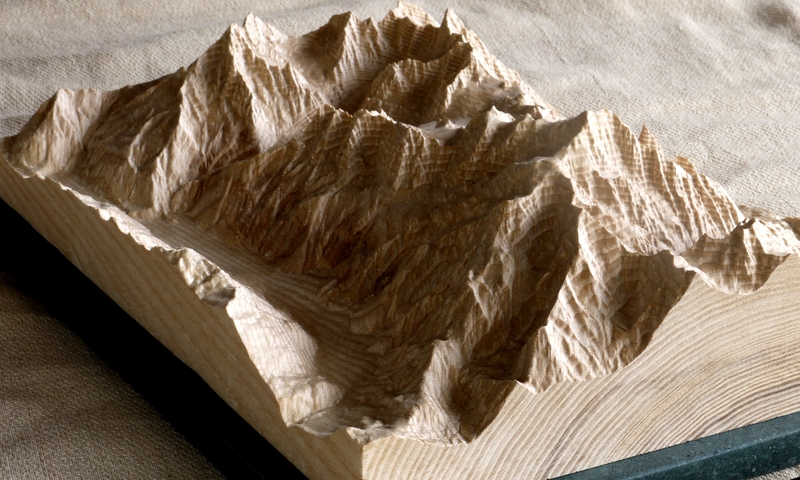 These are out most popular relief maps and make particularly nice gifts. We hand select our wood and then orientate it so that the grain has a contour line effect. They come mounted on slab of Lakeland slate. Altthough we generally have a few of these in stock of more popular areas, most of these are made to order as bespoke commissions as it gives you the control to design your own relief. You have full control of the area shown and the size it is carved at (i.e the scale). We have a range of woods to choose from including cedar (above), ash, sycamore and oak. Prices for these desktop reliefs start at £180 for the standard size of 14cm x 24cm. The largest size of 50cm x 30cm would usually cost around £750. The most popular size is around 20cm x 30cm which costs around £300 – £350, depending on the area shown. We can engrave an inscription on the slate base for a small extra cost. The areas available for this range include all of the UK, the Alps, Spain and some other areas by request. High resolution data is not readily available for every region unfortunately. If you would like to find out more about the commissioning process or to find out what we have in stock for immediate despatch, please use the contact form at the bottom of this page. 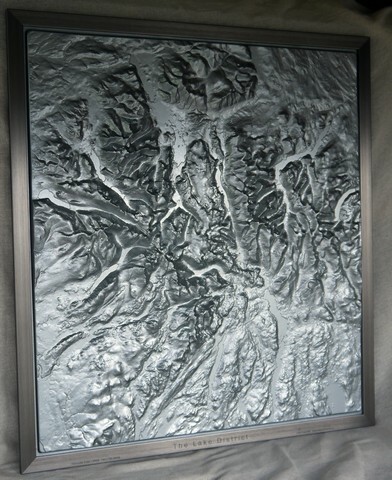 Our Lake District Classic relief map is large, high definition relief map made from vacuum formed plastic and then finished in a lustrous nickel or bronze finish. We then frame it for wall hanging. It shows every minute detail of the area in with scale accurate precision that serves a s great planning tool or simply as a work of art. This map is pretty big at 80cm x 90cm and covers most of the popular areas of the Lakes with a level of accuracy that will have you poring over it for hours. This relief map costs £140 plus £15 p+p (if required) as is available to order off the shelf for immediate despatch. To order please us the contact form at the bottom of this page. 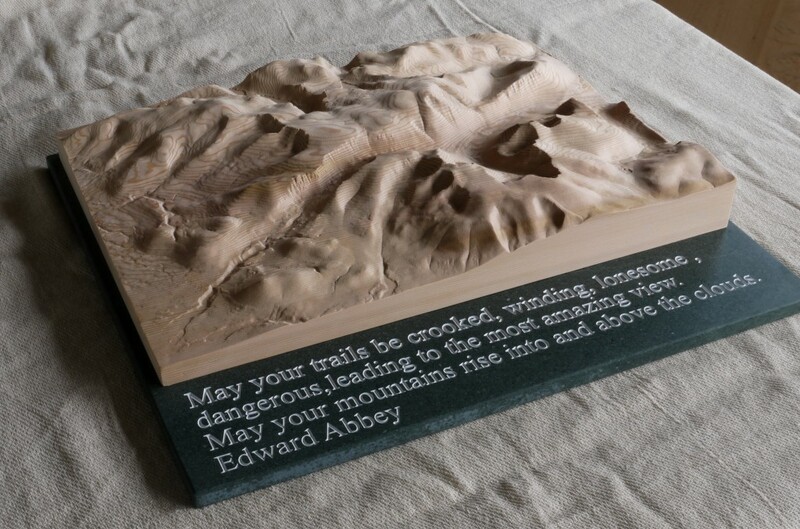 In addition to our two popular ranges above, we also offer larger bespoke relief maps for either wall hanging or plinth/table display. Some of these are for individuals to display in their homes but more frequently they are commissions from businesses wanting to help their customers interpret a landscape that has particular importance to them. We offer these larger relief maps in both wood and cast materials such as metal and ceramic/stone. We were approached by the newly developed Lakes Distillery at Bassenthwaite, Cumbria to deliver a bespoke relief map for their distillery tour. 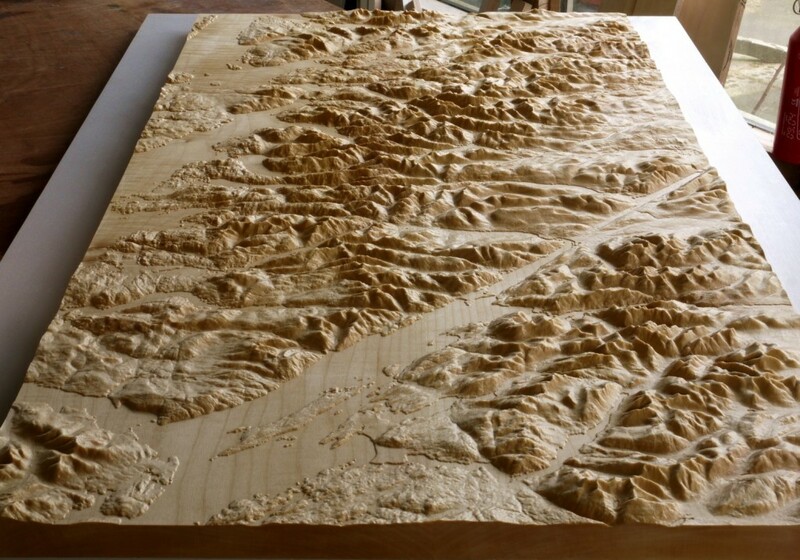 The relief map was to be of a material that could withstand the public environment of a visitor centre and the potential wear of constant touching (the reliefs are very tactile). 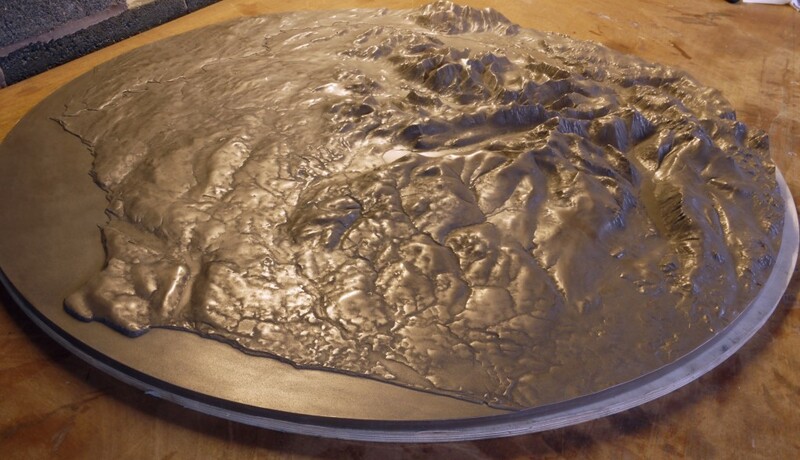 The relief map was to show their water catchment area in the Lake District fells and to sit on a plinth in the visitor centre of the distillery. After initial consultation we settled on a round relief of 90cm diameter to be cast in bronze resin. The key area of interest was the river Derwent catchment which starts high up near Scafell Pike and runs down through Borrowdale, into Derwentwater, then on through Bassenthwaite before passing the Lakes Distillery on its way to the sea at the Cumbrian coast. 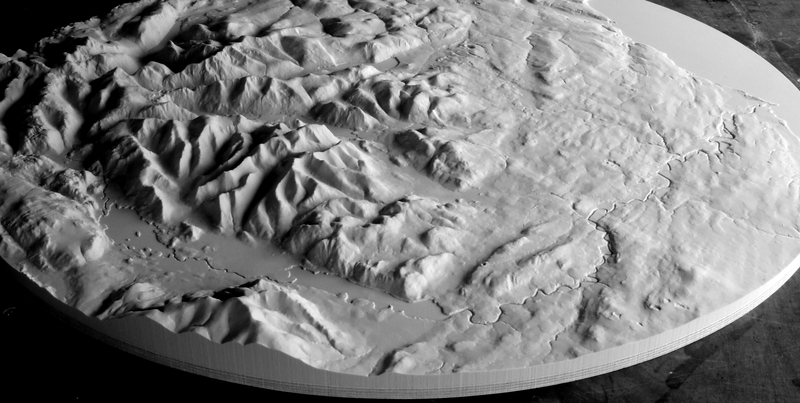 Using our unique processes we created a digital elevation model (DEM) that showed the river Derwent system as a distinct channel in the landscape, to stand out against the mountains and lakes of the area. This pic shows the master form with the channel of the river Derwent visible in the bottom half of the shot. After carving a master that required over 100hrs precision machining, I cast a silicone rubber mould before casting the bronze resin relief. Finally, I engraved the logo of the distillery onto the relief in the position where the distillery is sited. The relief map around 4 months to deliver from initial conception to installation. Here is a pic of the bronze resin cast on my workbench prior to installation at the distillery.